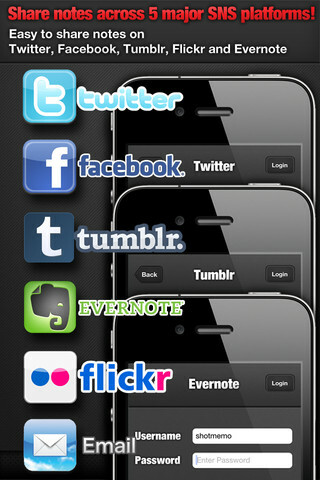 2/1/12 - 3/1/12 — Mobers.ORG — Your Daily Source For Mobile FUN! A Picture’s Worth 1000 Words, But Shot MeMo Doesn’t Stop There! I’ve become jaded when it comes to apps that promise me a quick n’ easy way to keep track of lists, notes, and whatever else. Despite this beautiful piece of technology I carry around with me everywhere I go, I find myself writing on torn envelopes, the backs of napkins, and my own hand. 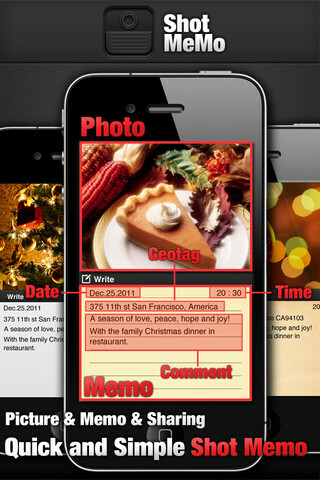 But Shot MeMo really is convenient enough to use as a digital memo pad, and it offers so much more, too. The basic idea is that you can attach a photo to a digital “note,” and then save or share it. There are a number of customizations, all available in an extremely streamlined set-up menu, so you aren’t messing with options when you’re in a hurry. Shot MeMo really does cover all the bases when it comes to jotting down something quickly that you don’t want to forget. 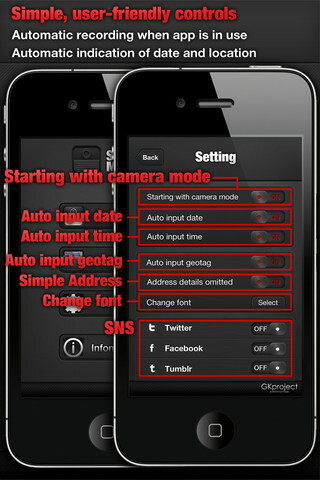 The set-up is basically a series of toggles for geotagging and timestamps and the like. You can also go ahead and log into whatever accounts you’d like to send your notes to; that initial log in during set up will stick, so you don’t have to mess with that later, either. Then, you’re ready to take notes. You can either take a pic from within Shot MeMo, or you can choose a previously taken photo from your gallery. 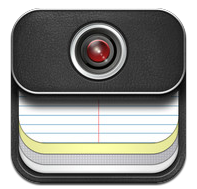 Once you’ve fallen in love with Shot MeMo, you’ll find it has plenty of uses aside from utilitarian note taking. 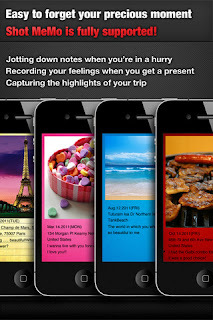 It’s also a fantastic method for capturing memories complete with date, time, location, a photo, and a few words of your own. And since there’s integrated access to Evernote, Facebook, Twitter, and Tumblr, you can tweet, blog, or post your experiences to share with your friends. You can, of course, also email and save your notes to your device gallery. CLICK HERE TO GET IT NOW !!! SalesVu - The Easiest Way to Accept Credit Cards Anywhere. SalesVu prides itself on developing innovative mobile and software-as-a-service solutions (SaaS) designed to make a direct impact to the bottom line for mobile and retail businesses. The SalesVu mobile payment solution is designed to significantly improve efficiency for the mobile workforce. It is comprised of a payment application for the iPhone and iPad, which connects to a secure cloud-based infrastructure for centralized management, reporting, and marketing. The SalesVu app allows mobile workers to process different types of transactions (cash, checks, credit cards, and gift cards) and automatically emails a receipt to customers. We send a free card reader to businesses who choose to process credit cards directly from their mobile device, and offer a low 2.7% rate on all credit card transactions (swiped or manually entered). Our app connects to a comprehensive cloud-based infrastructure in order to seamlessly integrate operations, management, and marketing. The SalesVu.com cloud- infrastructure allows business owners to manage their entire business anywhere – update prices, products, services, customer data, and automatically beam the changes to mobile devices in the field. Managers can also monitor mobile transactions and visualize sales trends by employee, product, or time of day, gathering significant marketing insight thanks to SalesVu's enterprise graphing and reporting engine. In addition to the operational benefits of the solution, SalesVu's patent-pending technology also integrates with Facebook so that businesses can share deals and generate buzz through their own customer base. The elegance of the SalesVu solution allows it to be much more than just a mobile payment app and turns it into a complete end-to-end enterprise business solution. "SalesVu" is the best point-of-sale and mobile payment app for iPad and iPhone. 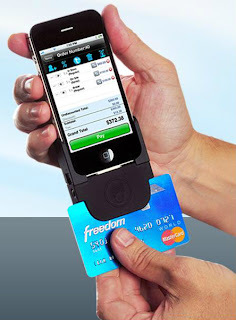 The app is Free and we send a Free Credit Card Reader to every business who registers. What on earth is Om Nom?! That’s what millions of fans of the widely acclaimed game, Cut the Rope, have been asking about the cute little monster who eats candy like its his job! That same question has a mad (but not bad) scientist studying the little creature that mysteriously arrived outside his house. Intrigued by Om Nom’s insatiable appetite for sweets, the Professor puts him through a series of experiments in this all-new game, a follow-up to one of the most original and fun-filled games on the App Store. 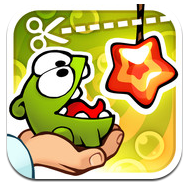 Cut the Rope: Experiments combines the same rope-cutting and monster-feeding action that millions of people around the globe have come to love, with new features and gameplay elements including Rope Shooters and Suction-cups. Can you help the Professor and Om Nom get through these wacky experiments? Meet the newest character in Om Nom’s adventures! The wacky Professor adds colorful commentary in response to gameplay achievements (or lack thereof! 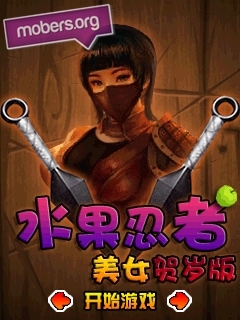 ), adding a new element of interaction between the player and the game. How did Om Nom end up outside the scientist’s house? And why is he so intrigued with the little creature? - New animated storyline featuring the professor’s intriguing commentary and reactions to Om Nom’s behavior – What will he think of YOUR achievements? - Game Center support for achievements and leaderboards - compare your progress to other rope cutters around the world! You’ve conquered the trail, now it’s time to tame the frontier! In this continuation of The Oregon Trail story, you and your family can finally settle down and build a new home. But that’s where the real adventure begins! Place buildings, crops, livestock and more to make a truly unique village, but prepare for unexpected dangers like wild buffalo stampedes or hurricanes. 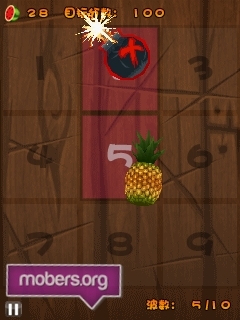 Gather supplies by playing fun hunting and fishing mini-games. Chat with villagers to get quests along with some true historic facts; you may even run into some famous names from history! Share the fun with friends by trading gifts and visiting each other’s towns. 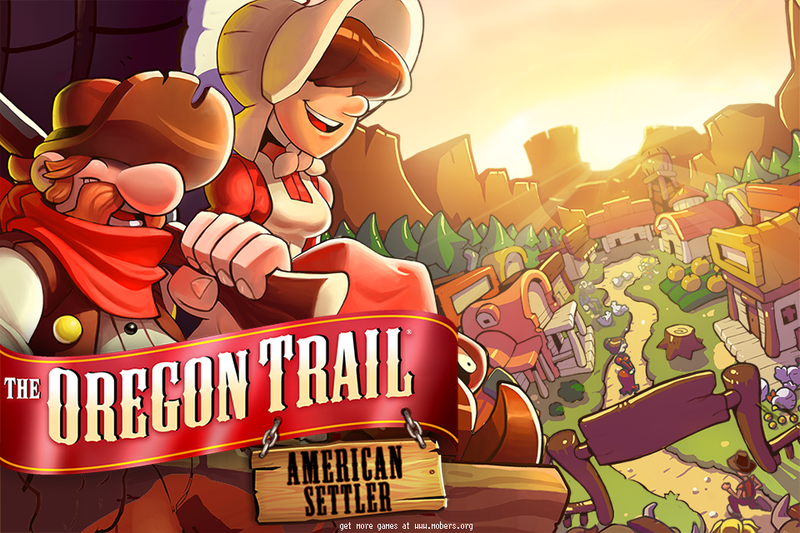 A new adventure gathering features you loved from the original “The Oregon Trail” plus great new ones from this brand new game! Create your own personalized frontier village by adding buildings, livestock, crops and taking care of your people’s happiness. Meet up with some of the most important figures in history, or have a quick chat with your townsfolk to uncover quests and some fascinating true bits of history. Random events, from stampedes to hurricanes, will challenge you to protect your villagers. It’s up to you to make the right decisions. Play fun mini-games to hunt or fish and stockpile supplies for your village to get you through even the toughest of times. 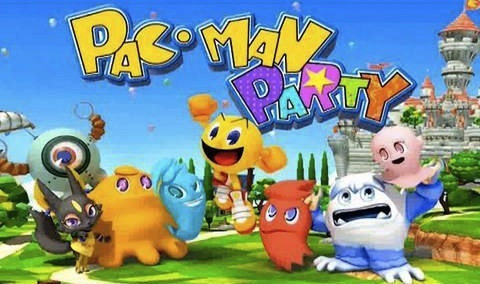 Join the fun as PAC-MAN, which celebrates its 30th anniversary with an exciting new match 3 game, PAC-MAN Party! Play with the ghosts and birthday gifts collect power-ups, erases every stage puzzle! Save your game going to move PAC-MAN around the outside of the stage and always one step ahead of those pesky ghosts!You can make a lot of fun mini-games, eat high-speeds up to shoot the guns! Conquer all three areas of goditii game and the atmosphere of this classic genre! People of Earth sent a diplomatic submarine Tornado to underwater city of Atlantis for negotiations to end the ongoing war. The submarine was carrying the leaders of Earth. When the diplomatic submarine has arrived, they understood they have been betrayed. The people of Atlantis didn't call them to negotiate for peace, but to exterminate their leaders. They started to attack Tornado with everything they have. Since Tornado is a diplomatic submarine, it doesn't have any heavy weapons to defend itself. The only thing Tornado can rely on intelligence of its captain and maneuveur ability of the submarine. 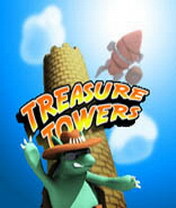 Operation Tornado is an action platform game that offers you hours of entertainment. 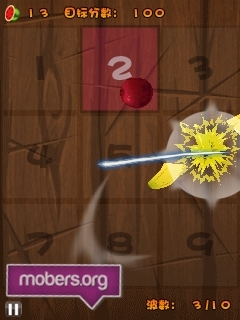 In the game you should avoid missiles to hit you and use them to destroy the enemy submarines. The passengers and crew of Tornado needs your help in this dangerous mission. Based on the classic ' Counter Strike ' game. Set of levels as for single mission so for network game. Huge choice of the weapon for task performance. Cool and great 3D graphics. 1. Download the CounterFire2.apk from the download section and install it on your phone. 2. Create a folder 'counterfire2' in the root of your sdcard and also create a 'basefire' folder inside it. 3. Download the pak.pk3 and country.dat and copy both to counterfire2/basefire. 4. Get serial number in password. Find someone to play with, meet up with friends, connect with groups of similar interests, and host and join chats, matches, and tournaments. 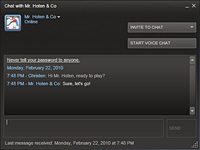 See when your friends are online or playing games and easily join the same games together. Chat with your buddies, or use your microphone to communicate in any game. 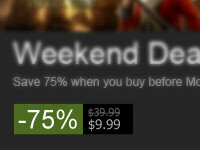 From pre-release discounts to free-play weekends, Steam delivers what gamers value most.